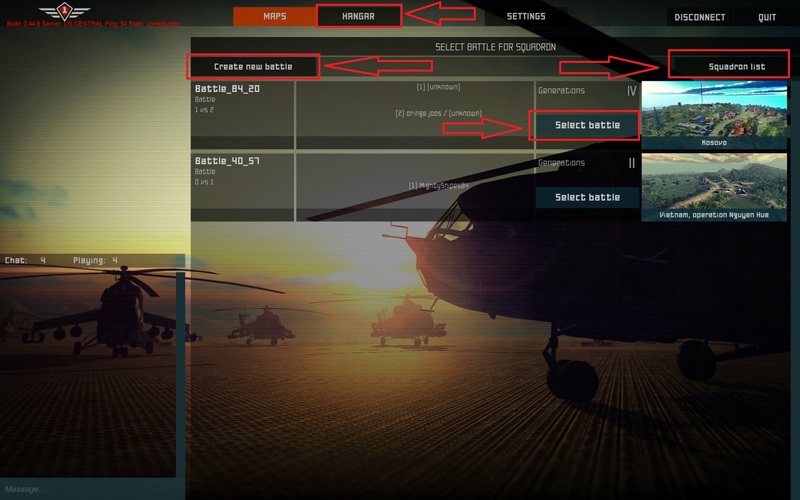 In this Guide, we are going to show you how to create and use "Squadrons" in Heliborne. 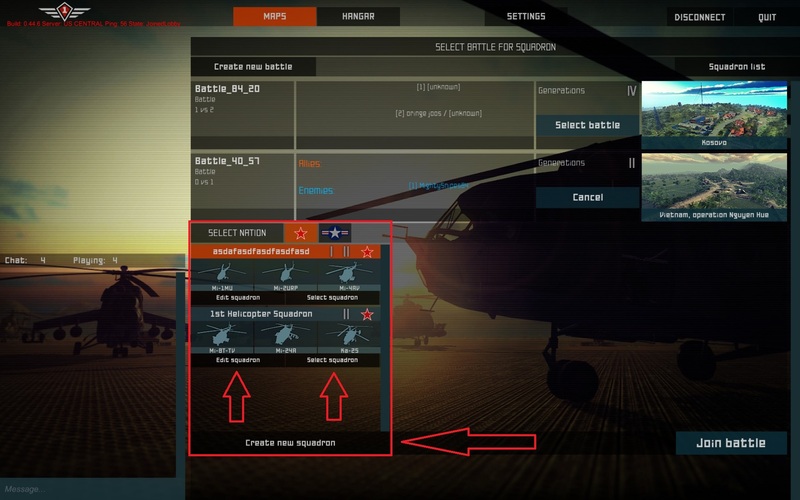 Select Create or Join Battle and then "Edit" or "Create Squadron"
Or, Select "Squadron" List and then "Create New Squadron" or "Edit"
You have a range of options to create and edit your Squadron. Firstly,we'll want to look at the "Squadron Construction" section. 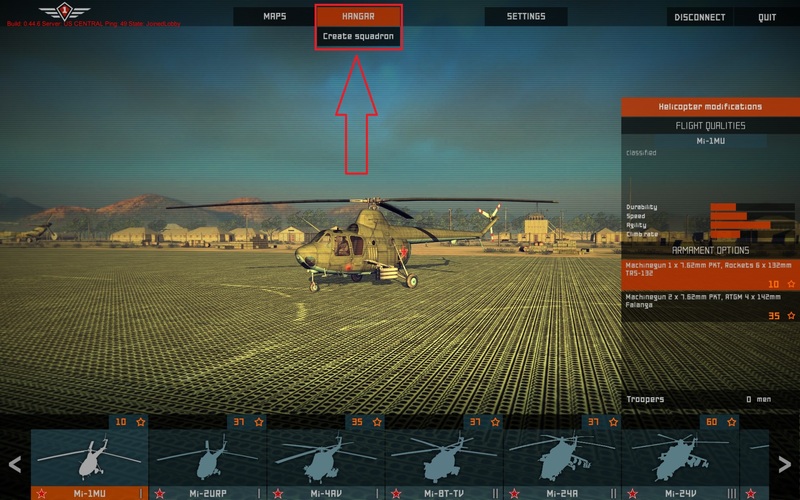 In this section we can select the "Generation" of Helicopters we want to see in the Helicopter Selection bar at the bottom of the screen. You can select the Generations by clicking on any button marked "Generation." When you do this, only helicopters that fit that generation will be available to be selected for your squadron. This section also shows the Squadron name area which you can edit by left clicking and typing in the name you wish for your Squadron. Finally, we can see "Squadron Cost" with a number and an orange star. This represents your total "point value" for creation of your squadron. 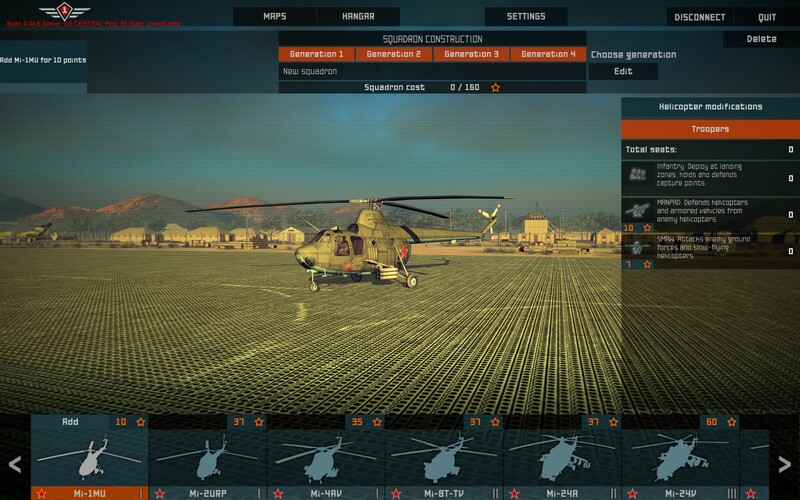 In this section you can get basic info on the selected Helo, as well as see it's Armament Options and the point values for those Armament Options. 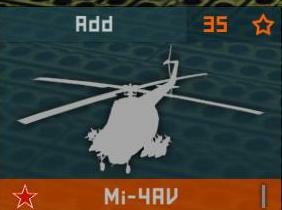 In this example, we can see the Mi-1MU has two loadouts. 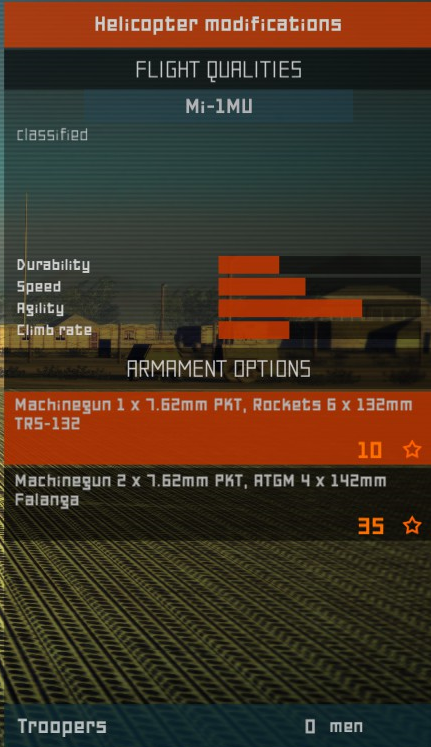 One for 10 points which is the default, and one for 35 points which is an optional loadout. 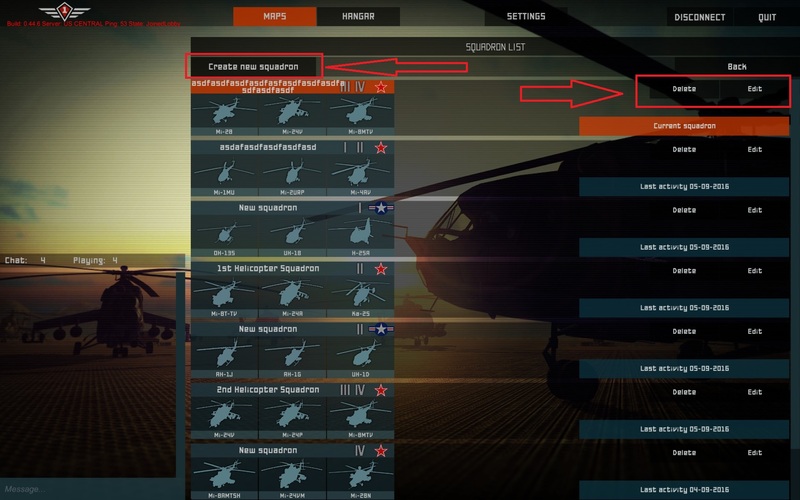 These loadouts will change the point value of the helicopter in your squadron, so be sure and keep an eye on your point total. 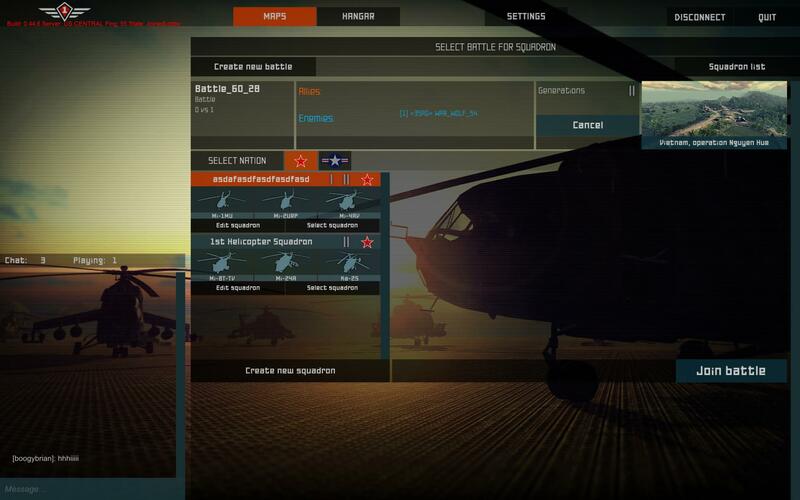 Lastly, when we're ready to add a helicopter to the Squadron, we simply click on it's portrait located in the bottom of the screen and click "Add". Once you have the helos you want, along with their loadouts and troopers and have either used up all 3 slots or all of your points. You're done and good to go! Simply return to the lobby by selecting the "Maps" button up at the top of the screen. When you're ready to join a battle, click on "select battle" or "create battle" if you're creating one. Once that's done, you'll see you pre-battle squadron selection panel. Left click on the squadron you want to take in to battle, then click on "Join Battle" and you're all set. We hope this guide is helpful and welcome any feedback or questions you might have. Last edited by Rayne; 09-05-2016, 10:36 PM.